From this food & beverage service training tutorial you will learn how to serve Cigar in hotel or restaurant in a professional and efficient manner in accordance with the standards. Cigar is a bundle of dried and fermented tobacco that is longer and thicker than a cigarette and prepared for smoking. 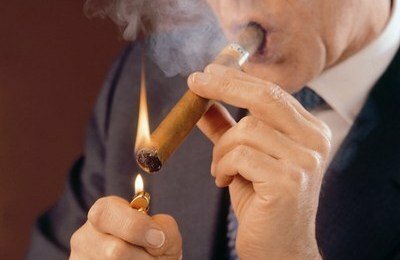 Cigar is highly popular in countries like USA, Germany, UK and in Western European countries. Before lightening the cigar, pre-arrange the cigar with necessary equipments. Reach to the guest table to serve cigar. Establish eye contact and approach the guest from the right side with a smile in your face. If cigars are packed in cellophane then unwrapped them first for serving. Hold the cigar using your left hand at the cigar bow (remove the bow after determine guest’s decision). In case the cigars are closed at their ends, open the slit. To protect the cover-leaf and to prevent inhaling for the guest, make sure that the cut is tidy and neat. To clear the folding leaves properly, cut the head of the cigar carefully. While cutting the cigar, check that 3 m.m. of the “head” should remain. Make sure that the cut is smaller than the diameter of the cigar and the opening is big enough to provide a proper puff. After properly arrange the cigar for the guest, present the cigar box. Open the cigar box for the guest with the cigar facing the guest by politely saying: “This is our cigar selection, Mr. X”. Let the guest first to choose cigar. Recommend guest in selecting cigar (if required). Name or brand of the cigar. The taste (ex-/ mild /light). The price of the cigar. If the guest asks you to pick the cigar for him, hold it with your finger and put it on a B&B Plate. If the guest selects the cigar and want to cut the cigar by himself, serve 1 box of match and the cigar cutter and place them on a B&B Plate. If the guest wants you to pick the cigar for him but wishes to cut the cigar by himself then hold the cigar using your fingers and serve the cigar on a B&B Plate with a 1 box of matches and the cigar cutter. If the guest picks the cigar but does not want to cut it by himself, cut the cigar for him and serve the cigar together with a box of matches placing them on a B&B plate. Ask the guest if he needs anything else. Make eye contact and leave the table by saying courteously: “Enjoy your cigar, Mr. X”. Always address the guests by using their name (if possible). Do not touch the end of the cigar with your fingers since the guest will put this part in his mouth. Before cutting the cigar, determine guest’s requirements (ex-small/ medium/large opening).